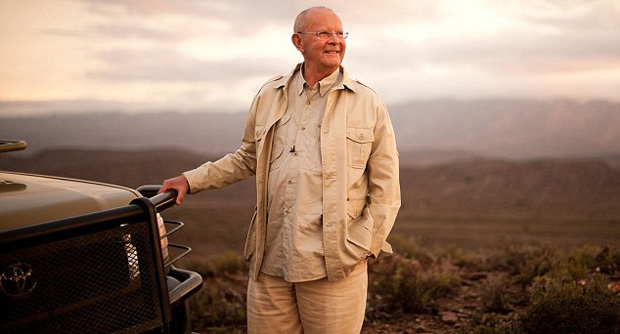 Wilbur Smith is an acclaimed South African author who writes historical fiction about South Africa and its relations with the rest of the world. Your books have sold a collective 130 million copies worldwide. What is the secret to writing a book that readers from any culture can enjoy? I believe good adventure writing is choosing persons or characters who are from real life and then embroidering them a bit more to make them beyond life. I write about men who are more manly and beautiful women who are really more beautiful than any women you’d meet. What was it like to write your first nonfiction book after writing over forty novels? In 2011 I was invited to the Massenzio Festival in Rome. I was asked to give a lecture in front of thousands of Italian readers in the shadows of the Coliseum where I started telling the story of my father and how he saved my family, all the campers, and me from man-eating lions who attacked our camp one night. My father taught me about life, about being a man, about all living things, like animals, birds, vegetation, and nature. What I have learned from my father became the origins of my own adventures. At the end of the speech, I said: “One day I will write about my father.” My father plays a significant part of my memoir, On Leopard Rock. How did your relationship with your father affect your writing? I have a faded photograph taken with my mother’s Box Brownie camera the morning after my father protected our camp. My father and I are kneeling side by side, each holding the head of a dead lion. My father’s right-hand man Peter is standing beside the Chevy hunting truck in the background. He is wrapped in his blanket and looking heroic and aloof. My father is wearing his pajama bottoms, his nose swollen and lacerated. I am wearing one of my father’s hats and mimicking his grim and heroic expression. That’s a scene I’ve written in my novels in many different ways over the years. As you can guess, he had an enormous effect on me. There are a lot of adventures in your autobiography but which one is the one that you most enjoy telling people about and why? Going black marlin fishing in Queensland, Australia, in the company of a big, macho, and very competitive Lee Marvin is something I’ve never forgotten. Another episode from my early life was being attacked by a black mamba when I was a boy. That’s something I’d like to forget! Which contemporary American authors do you most admire, if any? John Steinbeck for his sense of humor and humanity. Ernest Hemingway for how he distilled action and character into the most powerful sentences imaginable. Stephen King is the master of horror and suspense. And I can’t leave out Larry McMurtry for his epic stories of Texas and the Old West. In the U.S., South Africa and its history have become more visible, as it were, in recent years. Can you tell us how your books illuminate that history and what Americans can learn from your books? I think Americans will learn that people are people, no matter if they are black, yellow, green, or white. And that history, in all its horrible beauty, shows the darkest depths and majestic, soaring heights of human nature. Africa, with all of its natural and historical drama, is the perfect backdrop to learn all about the horrors and wonders of our great continent. What can American readers look forward to while reading your books? In our turbulent times it’s important to take a step back and escape your phones and educate yourself about history. If you want to know about where we are going, look at the past. Africa is the cradle of civilization. We all come from that continent in one way or another. The number of books you’ve written is very impressive. Could you talk a moment about how you write? How is it working sometimes with co-writers? What are your favorite parts of writing a book? Do you have any tips for writers? I start a novel when I am sure about how to write the opening, after months and months of research where I live in the world I want to write about. I never take notes. If it’s worth remembering, you don’t need to write it down. Then I set off, letting my imagination roam around the story archipelago in my mind. This is the best part of my writing. Working with co-writers has been exciting. I have so many ideas already developed. Short outlines and so many characters who are waiting on those pages to have their story told. I simply can’t write all the stories myself as each novel takes up to a year to complete. It’s been enjoyable to pass on what I know about writing and to work with talented co-writers who are besotted with my fictional universe. What would you most like American booksellers and librarians to know about you and your books? Try reading one of my novels, which millions have enjoyed around the world in more than thirty languages. I hope you will like my work of over fifty-five years. I would say start with When the Lion Feeds, which I would describe as an African Western. The novel is set in the greatest gold rush the world has ever seen. I think you’ll find that you’ll enjoy getting lost in Africa and its treasure trove of stories.